The Ozark Beauty Strawberry Plants are probably the hardiest strawberry plants as well as the most vigorous and one of the best producing ever bearing strawberry fruit that we’ve tested. Ozark Beauty Strawberry produce excellent quality strawberry fruits that are bright red, amazingly large and firm with a sweet, luscious flavor. Thanks to the Ozark Beauty Strawberry Plants, you’ll be feasting on huge crops of these exceptionally delicious scarlet-red berries from early summer until the first frost. All winter you’ll savor strawberry preserves and frozen strawberries. 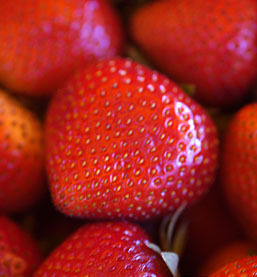 Ever bearing Strawberries produce an early summer crop and also a fall crop with some berries on and off all summer. You will make the best strawberry desserts! TIP: Pinch off blooms for first two months on ever bearing strawberries to promote larger harvest. Strawberry plants ship in fall (late November) and in early spring (early March to May).